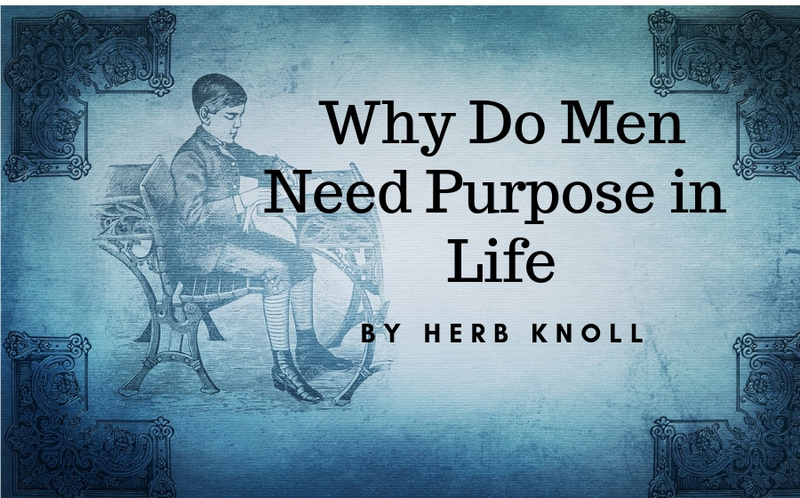 Men need to have a purpose in life. A reason to get up in the morning. Absent purpose, why live? I hear it in the voices and read it in the posts men make on “Widowers Support Network – Members Only” (WSN-MO), a FREE and private “men’s only” page on Facebook. With the passing of their brides, men lose much of the purpose for which they lived. Purpose enhances a man’s. Purpose provides men the means to see value in their existence. Perhaps that’s why men become fixers. If you give a man a problem, he’ll apply a fix to it. If the fix doesn’t work, no problem. He’ll just use a second fix. (And he’ll most likely do it without asking for help. Why? Because men hate asking for help. Example: When was the last time you saw a man ask for directions? The only thing that saved modern men from endlessly driving around in circles is the invention of portable GPS. Men have a bias for action. And they should embrace it. It’s something I think men particularly benefit from doing. Want proof how men are wired to be fixers. Let me tell you about my brother Don. Don and his wife, Kathy, were on a plane. A young boy seated behind Kathy kept kicking the back of her seat. Kathy leaned over and mentioned it to Don. Immediately, Don looked back over his seat and told the young man, “Knock it off.” Kathy was chagrined. Fixing things gives men a sense of purpose, and it relieves a lot of frustration. Yes, having a purpose, even if it is to be a “fixer” is part of every man’s DNA. As I read painful stories of my brothers on WSN-MO, I can’t help but think, many of them have lost purpose. A purpose will rarely jump up and present itself to you. Those in search of purpose need to go out and discover it on their own. I wonder how many of those served by the WSN-MO have yet to do so. I wonder how many of their wives in heaven wish they would at least try. I wrote about the importance of purpose in my book, The Widower’s Journey. I can’t encourage widowed men enough to seek their purpose during this, the next phase of their earthly life. Frankly, Serving as the founder of the Widowers Support Network and the gatekeeper of the Widowers Support Network – Members Only (WSN-MO) on Facebook gives me purpose. Each day, afternoon and evening, I have the honor of serving men from around the world in successfully navigating their grief. For this, I am incredibly grateful. But I don’t rely solely on helping widowed men to satisfy my desire to have a purpose, to contribute to the happiness of others. Nearly three and one-half years ago, I joined the Knights of Columbus (KofC). The KofC is the largest fraternal Catholic organization in the world. Today, I serve as the Chancellor of my parish’s local council. The blessings I receive from advancing the agenda of the KofC is immeasurable. As Chancellor, I also serve as the chair of the sick and visitation committee. In this role, I frequently visit members of the KofC, whether it be at their residence, their nursing home or even their hospital room. This past week, I had the honor to visit with Sir Knight Dan Dittmer (83). Dan is a combat veteran who served as a U.S. Navy fighter pilot. Once when flying a mission during the Korean War, Dan lost his plane and was forced to parachute, injuring his back. Later, and during a duty assignment at Pearl Harbor, Dan became friends with the actor, Roger Smith (star of 77 Sunset Strip) and his wife, Ann-Margaret. His career later transitioned to that of a swimming coach, gaining him international recognition including having been recruited by Disney to serve as the Director of Aquatics at Disney World. Given his mature state, Dan most likely didn’t even know I was there in the room. But I knew I was in the presence of a giant of a man, a man among men. And my visit was made possible by my first having the purpose of serving the Knights of Columbus. Purpose can come in many fashions. This past week, my wife Maria and I got up early to make twenty-five sandwiches that we needed to deliver to a special after school program for disadvantaged young children. Again, I found a purpose. Whether your discovery of purpose is to serve the Red Cross, coach a League Baseball team, join a fraternal organization as I did or volunteer at your local SPCA, your skills and heart are needed by many. But make no mistake, finding purpose makes you the big winner. Herb Knoll is a retired banking executive, an advocate for Widowers, a professional speaker and author of the breakout book, The Widower’s Journey. Available at Amazon.com in paperback and in all digital formats. Herb is the founder of the Widower’s Support Network (WidowersSupportNetwork.com) featuring the Widowers Support Network – Members Only, a private Facebook group page for men, and a second Facebook page which is open to the general public at Widowers Support Network. Contact Herb at herb@WidowersSupportNetwork.com.